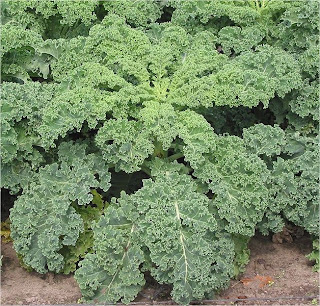 New Year, New You - Healthy Ingredient #3: Kale! How I used to think of green vegetables! If you had told me a few weeks ago it was possible for me to like kale, I would have laughed at you. Chortled might actually be a more accurate word, because due to a serious aversion to green foods that dates back to childhood, I have never gone near the stuff. In the spirit of exploring more healthy ingredients however, I was feeling up to the challenge. I also recently came across a basic recipe for Kale Chips that sounded easy to make and potentially tasty so I decided to give it a try. I mean, this time of year, who isn't looking for an easily accessible, healthy snack to stave off those dastardly post-holiday cravings? Why kale you might ask? This member of the cabbage family (Brassica oleracea) has been getting some attention lately in culinary circles and for good reason. In addition to having a very distinct flavor, kale is chock full of nutrients including beta carotene, vitamin K, vitamin C, lutein and calcium. Like broccoli, it also contains the chemical sulforaphane which has very potent anti-cancer properties. In order to preserve these desirable nutrients, it's best to prepare kale by steaming, stir-frying or baking; boiling can cause a decrease in the concentration of these chemicals. Kale has a variety of culinary applications in many countries around the world. In Ireland, it is mixed with potatoes to make the traditional dish colcannon. Kale is also popular in China, Taiwan and Vietnam where it is often combined with beef in a stir-fry and in Portugal, it is often combined with pureed potatoes, broth and spicy sausage to make the traditional soup, caldo verde. Other countries that also have a traditional dish that utilizes kale are the Netherlands, Brazil, Germany, Denmark, Sweden and Africa. This green which dates back to the 4th century BC, has certainly made an international impression! I hope you enjoy this quick, easy and delicious recipe for kale chips. Feel free to experiment with different toppings and flavor combinations to suit your taste. If you have leftovers, the chips can easily be stored for a few days in a Ziploc baggie or airtight container. Following my previous recommendations of quinoa and lentils, this post concludes the series of three healthy ingredient suggestions for the New Year here on the Glamorous Gourmet. 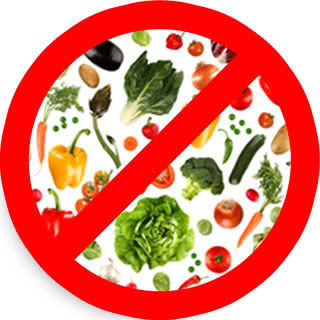 I hope you've enjoyed learning about these healthy options! Coming up next are my interviews with two esteemed figures in the wine world, Christie's Head of Wine for the Americas, Robin Kelley O'Connor and Executive Editor of Wine Spectator magazine, Thomas Matthews. They were kind enough to sit down with me during a recent trip to New York and share details about their respective journeys and successes in the wine industry. Please stay tuned for their interesting stories, I look forward to sharing them with you. Tear kale leaves into "chip"-size pieces and place on baking sheet. Drizzle the leaves with olive oil and season with Kosher salt and pepper to taste. Toss kale with seasonings and arrange in a single layer on the baking sheet. Bake kale chips for 15 minutes and remove from oven. Sprinkle chips with grated Parmesan cheese and red pepper flakes to taste and bake for an additional 5-7 minutes or until cheese is melted and chips are sufficiently crispy. 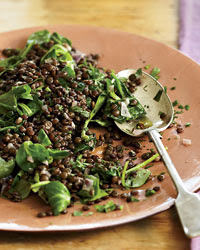 New Year, New You - Healthy Ingredient #2: Lentils! Ah, lentils! I've been a fan of this legendary legume since enjoying my Grandmother's homemade lentil soup as a child. Having sampled them in many incarnations since, I have to say their inherent earthiness and delightful texture always keep me coming back for more. I especially find myself drawn to lentils during the Winter months when they can effectively double as both a comfort food and a health food. What's not to love about that? Much like quinoa (Healthy Ingredient #1), lentils were introduced to the human diet a long, long time ago, approximately 9,500 - 13,000 years to be exact. They were actually the first domesticated crop in the Near East. 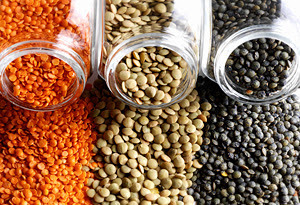 Lentils are presently available in many different colors, shapes and sizes. Whether it's the hearty, peppery French green lentils (lentilles du Puy) or the delicate, colorful red lentils, there is definitely one to suit your taste. 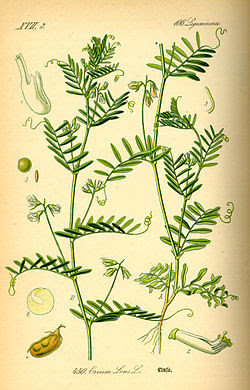 Also, lentils are sold in a variety of forms including with or without skins, whole or split. Culturally speaking, lentils have turned up in some well-known yet very diverse sources including the Hebrew Bible as well as Grimm's well-known fairy tale, Cinderella. In Italy, it is a tradition to eat lentils on New Year's Eve to symbolize hope for a prosperous year ahead. Nutritionally, lentils have the third highest protein level of any legume following soybeans and hemp, and are also a rich and inexpensive source of iron, fiber, folate, vitamin B1 and minerals. They are very popular in many vegetarian cultures around the world especially those in Asia, the Mediterranean and West Asia. In these regions lentils are usually mixed with rice or other ingredients to round out a meal. In Europe and the Americas, it is common for lentils to be made into a soup and combined with meat such as chicken or pork. I guess you could say lentils are the Philip Seymour Hoffman of the legume world, pretty unassuming at first glance yet they play some pretty amazing supporting roles! I happened across this recipe for Lentils with Red Wine and Herbs in the January issue of Food and Wine Magazine. 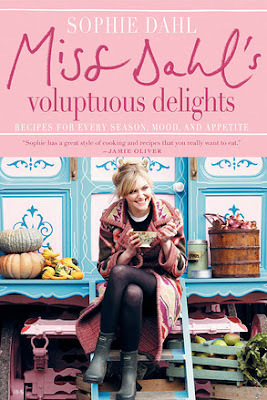 It was contributed by Sophie Dahl, granddaughter of famed British author Roald Dahl, and appears in her cookbook Miss Dahl's Voluptuous Delights. In the book, she fondly refers to it as Paris Mash since she would make it regularly while visiting her friend in Paris. Dahl uses very little meat in her cooking and focuses instead on fish, vegetables and whole grains; however, like her grandfather with his penchant for Burgundy, borscht and dark chocolate, she is no fan of deprivation! Dahl advocates using small amounts of 'voluptuous delights' in her cooking including crème fraîche, butter and cream. She definitely sounds like my kind of girl! When making this recipe, French green lentils work best since they hold their shape really well during cooking. For the red wine, I used a 2010 Georges Duboeuf Beaujolais Morgon but any light- to medium-bodied red wine would work just fine. If you were planning on serving this dish with a protein, I would opt for a leaner cut of red meat. The smoky, earthy flavor of the lentils begs for something a bit heavier than fish or white meat chicken. I hope you enjoy this recipe, it is currently on regular rotation at my house! New Year, New You - Healthy Ingredient #1: Quinoa! As many of you know, writing about health food is not really my thing. Rice cakes, tofu and bean spouts are not exactly the most glamorous or flavorful ingredients out there and, truth be told, I have usually avoided them at all costs. While I don't consider myself quite as naughty as a certain Ms. Paula Deen, I have to admit I usually prefer a little decadence in my dishes. That being said, I have recently found that healthy and delicious need not be mutually exclusive. This week I'll be highlighting three healthy ingredients that are chock full of flavor and nutrients, a culinary "win-win" if you will. Without further ado, I'd like to introduce you to the first healthy ingredient you simply must try in 2012. Quinoa (pronouced 'keen-wah', accent on the first syllable) is considered to be an "ancient grain" and was of great nutritional importance in Pre-Colombian Andean civilizations. 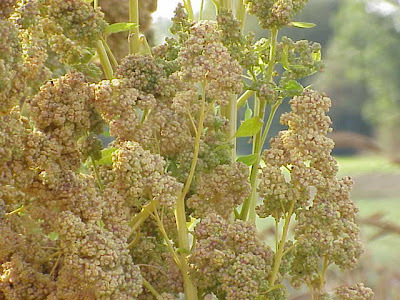 While usually considered a whole grain, quinoa is actually a grain-like plant grown for its edible seeds. It is not a member of the grass family at all and is more closely related to species including beets, spinach and tumbleweeds. Don't let that deter you, however, because quinoa is actually prepared in much the same way as whole grains like rice or barley. Cooked quinoa has a lovely light, fluffy texture and a mild, nutty flavor and is incredibly versatile! As an added bonus, it's also gluten-free, cholesterol-free, kosher and almost always found in an organic form. Unlike wheat or rice products though, quinoa contains a balanced set of amino acids making it a complete protein source which is highly unusual among plant foods. It is also a good source of fiber and is high in magnesium and iron as well. I discovered this delicious quinoa recipe in the January 2012 issue of Bon Appétit magazine. The article was entitled "The New Veg" and featured the cuisine of Israeli-born, London-based chef Yotam Ottolenghi who is the current undisputed master of vegetable cookery. A hallmark of Ottolenghi's style is his attention to the texture, color and overall look of a dish with an emphasis on creating beautiful as well as delicious food. I have to hand it to him, this quinoa dish is brilliant! Not only is it beautiful, I can't believe how well all the flavors and textures worked together. I hope you enjoy this recipe as much as I did and have fun exploring the various incarnations of this 'Ancient Grain'! Using a small sharp knife, cut all peel and white pith from lemon. Cut between membranes to release segments; discard membranes and roughly chop. Add lemon with any juices and remaining 1 Tbsp. oil to quinoa; stir. Add fennel mixture, chile, and herbs. Toss gently to incorporate. Season with salt and pepper. Transfer salad to a platter; sprinkle with pomegranate seeds. New Year, New You - Part 1: Three Wines to Try in 2012! Well, my Fabulous Foodie Friends, 2012 is off and running and if you're looking to make some changes in your food and wine routine, The Glamorous Gourmet has got you covered! Whether it's breaking out of your ho-hum wine routine, experimenting with healthy new ingredients, or possibly finding a career in the wine world I've got some creative suggestions and fabulous interviews that I'm very excited to share with you this month. I hope you enjoy January's focus on new food and wine discoveries in the new year. If you are a fan of Sauvignon Blanc, Pinot Gris or even unoaked Chardonnay, give Argentina's signature grape Torronté, Brouilly and Côtes de Brouilly.